Putting a meringue layer in my cakes is quite possibly the best thing I’ve ever thought to do in the kitchen. It adds such a delightfully light and airy crunch and sweetness. I’m hard pressed to think of a cake it wouldn’t work with (except maybe maybe a stodgy gingerbread or carrot cake), but it went especially well with this cake. 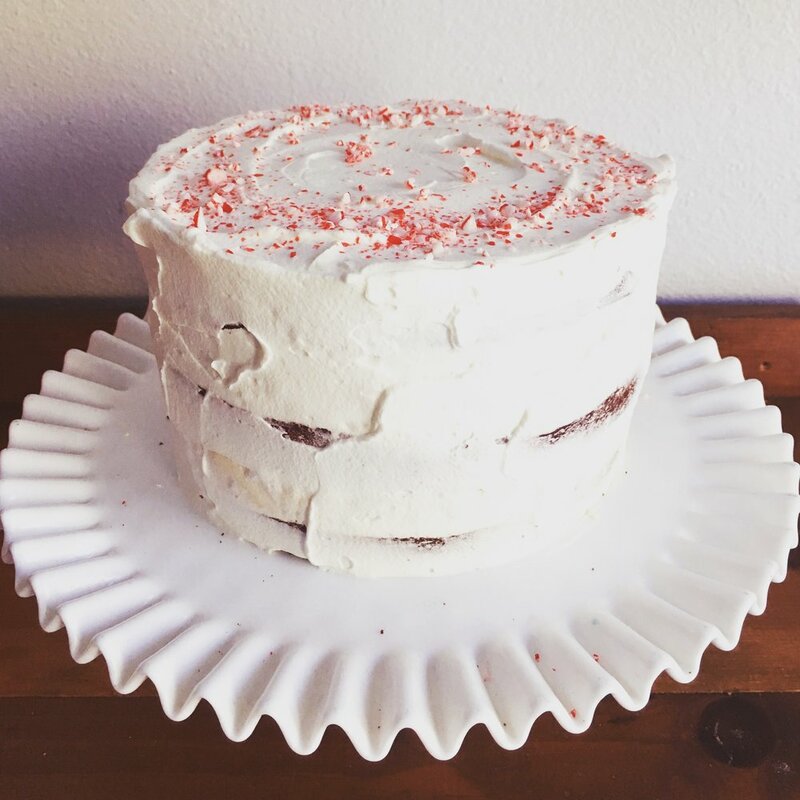 Peppermint flavored meringue with chopped chocolate folded into it and baked till crisp and melt-in-your-mouth is like a holiday party in your mouth on its own, but layer it with red velvet cake, cream cheese frosting, a delicate minty whipped cream and crushed candy cane and you’re just hitting all the spots. I’ve got to be honest here, though, I’ve never been big on red velvet. It seems confused to me, like it can’t make up its mind about itself. But it looks spectacular and is versatile; at least that’s why I thought up this particular cake. I looked at a lot of recipes and some use butter, some use oil, some use a combination. I suspect that oil produces moister results with a batter that has cocoa powder, but I went with butter thinking that a lighter crumb would work with the meringue layers. It was a wonderful cake to handle; it rose beautifully, sliced like a dream, and didn’t crush the meringue with its weight. It might have been a tad on the dry side (gasp!) so maybe next time I will brush it with a soak or syrup. Also its flavor was subtle - in another setting I might even call it a touch bland (another gasp!). 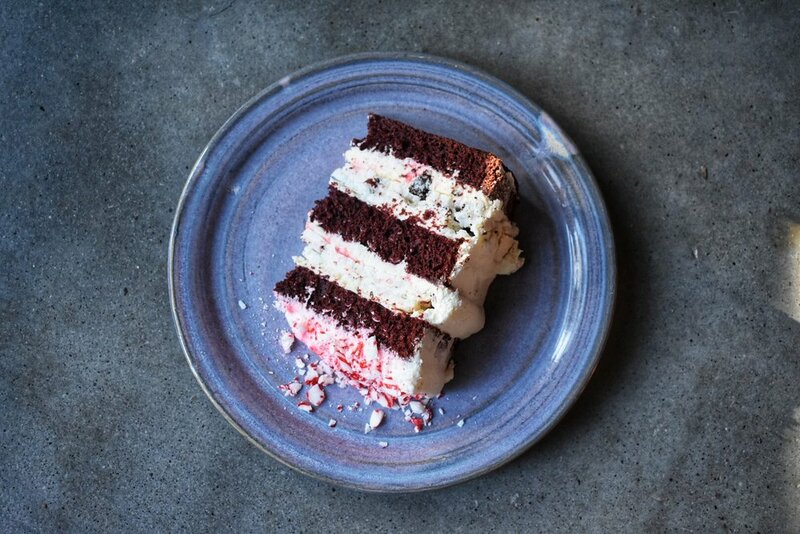 But in this cake it was a good base for the other strong flavors of dark chocolate, cream cheese, and peppermint. It all comes together in neat and contrasting layers and makes a total holiday show stopper. All the elements might seem like a lot but the cake doesn’t take more than four or five hours of work, start to finish, including bake time. Just read through the recipes and be sure you’ve got your ingredients prepared and timing right and it will all come together! I recommend getting it done in this order: 1) Start with the cake layers While they’re baking, 2) make the pudding base for the frosting and 3) whip up the meringue. While the cake is cooling, bake the meringue layers. While those are cooling, 4) finish the frosting and let it set up. Then slice the layers, whip the cream, and assemble! Preheat oven to 350 and grease and flour 2 8-inch circle cake pans. Or use a flour baking spray because that stuff is magic. Also, I had too much batter for my two 8 inch pans and baked a whole extra 6 inch layer. You could do the same, or use three 8 inch pans, or 2 nine inch pans, or make some cupcakes, or just discard the extra batter (but that would be such a wasted opportunity…). In a small bowl, sift together the flour, baking soda, baking powder, cocoa, and salt. In another bowl, whisk together the buttermilk, creme fraiche (or sour cream), food coloring, and vanilla. Beat together the butter and sugar on medium high speed until light and fluffy, a couple minutes. Add the eggs on low speed, then beat on medium high speed for another minute or two until combined. Stop the mixer and scrape the sides and bottom of the bowl, then beat it another 15 to 30 seconds. On the lowest speed, add the dry ingredients in three increments, alternating with the buttermilk mixture, mixing until just barely combined. Remove the bowl, scrape the sides and bottom, and fold the mixture gently to ensure it’s all thoroughly mixed. Don’t overmix! Divide between the prepared pans, being careful not to overfill. (Generally 2/3 full is safe.) Bake for 45-55 minutes or until the cake springs bake when pressed lightly. That seems really long for baking a cake, right? I started checking around 40 minutes. Let cool for 10 minutes, then flip out of the pans and let cool completely on a wire rack. Set oven to 225. Prepare your 8-inch pans by buttering lightly and coating with a thin dusting of powdered sugar. Line the bottom with parchment paper. Combine egg whites, salt, and cream of tartar in a standing mixer fitted with the whisk attachment. Beat on high until frothy and then soft peaks begin to form. Gradually add all the sugar in small spoonfuls, then add then extracts, then continue to beat and beat and beat until glossy and stiff peaks form. Gently fold in the chopped chocolate with a spatula. Divide between the prepared pans and carefully spread into level layers. Bake 1 1/2 hours, then turn off the oven and prop open the oven door and let cool for 30 minutes. Remove and let cool. Carefully remove from the pan by using a thin knife to loosen the edges from the sides of the pan. Invert the pan and don’t drop the meringue because it will shatter and so will your heart. First make the pudding base: whisk together the flour, sugar, cornstarch, and salt in a small saucepan. Gradually whisk in the milk, then set over medium heat and cook, stirring frequently, until thickened and pudding-like. This takes 5-8 minutes. Transfer to a bowl and allow to cool. Combine the ingredients in a standing mixer fitted with the whip attachment. Whip until firm peaks form. First slice the cake into layers. Your cakes should have mounded nicely in the oven. Slice off those mounded tops. (Save those scraps! Check the notes below for ideas.) Then slice the layers in half. I find the best way to do this is to drag a long serrated knife along the mid-way line all around the cake. Then I make a shallow cut into the cake as I move around the layer, using a kind of sawing motion, being sure to keep my knife level. Then I cut a little deeper, eventually working my knife all the way into the center. Place one layer of cake on your cake stand. Cover with a quarter of the cream cheese frosting. Sprinkle with crushed candy cane. Place another cake layer, and repeat steps 2 and 3. Spread the whipped cream all over the sides and top of the cake, or do a thick layer on top and a thin scrape along the sides for the more rustic, semi-naked look. Whipped cream has beautiful textured look, in my opinion. Decorate with sprinkles or more candy cane. The candy cane will weep and melt on the whipped cream frosting, so best to do it just before serving. You will have leftover cake. Cake freezes so well, so there’s no point in throwing it away! Ideas for using it: snacking. Haha. Or a trifle version of this cake. Or cake pops! Simple smash together with another batch of the cream cheese frosting, shape into balls, freeze, then dip in candy coating. People go crazy over cake balls! This could easily be a 9 inch cake … just use 9 inch pans instead. If you want to brush the cake with a soak or syrup, I could see Kahlua working for a peppermint mocha frappucino effect, otherwise a mint or chocolate liquor.